Toyota Motor Corp.'s 62 percent boost and Nissan's 57 percent gain led Japanese automakers' global production increases in April. 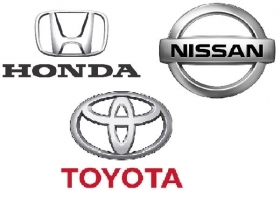 (Bloomberg) -- Toyota Motor Corp., Honda Motor Co. and Nissan Motor Co. all increased global vehicle production in April as the Japan's largest carmakers responded to rising demand in Asia and the United States. Toyota, the world's biggest automaker, made 62 percent more cars than a year earlier, producing 591,109 vehicles in April, it said Friday in a statement. Exports at the Japanese company more than doubled, rising 117 percent to 150,118 units, while overseas output went up by 55 percent. Production in Japan increased 71 percent. Nissan said production of its cars and light trucks surged 57 percent to 319,673 units compared with the same month last year. Output at Honda increased 27 percent to 294,308 vehicles, the automaker said Friday in a statement. The three automakers built more vehicles as demand recovered in the United States and Japan and continued climbing in China, the world's largest auto market. A year ago, carmakers scaled back output, temporarily halting production lines to reduce inventory amid a recession. Auto sales in the U.S. rose for a sixth month in April. Toyota's sales rose 24 percent, while Honda's deliveries in the country increased 13 percent from a year earlier. Nissan climbed 35 percent.